Pieces of Life: The Defense Cateory of the Federal Budget Is Not ONLY "The Military Budget"
The Defense Cateory of the Federal Budget Is Not ONLY "The Military Budget"
The proposed federal budget - it’s that time of year . . . again. I want to point out that the Defense category of the budget is often misconstrued as “the military budget” when in fact Military Defense is only a part of the entire Defense budget. The topic here is how the Defense budget is categorized. The variety of categories at the end of this article might be a surprise to some. It certainly was to me. 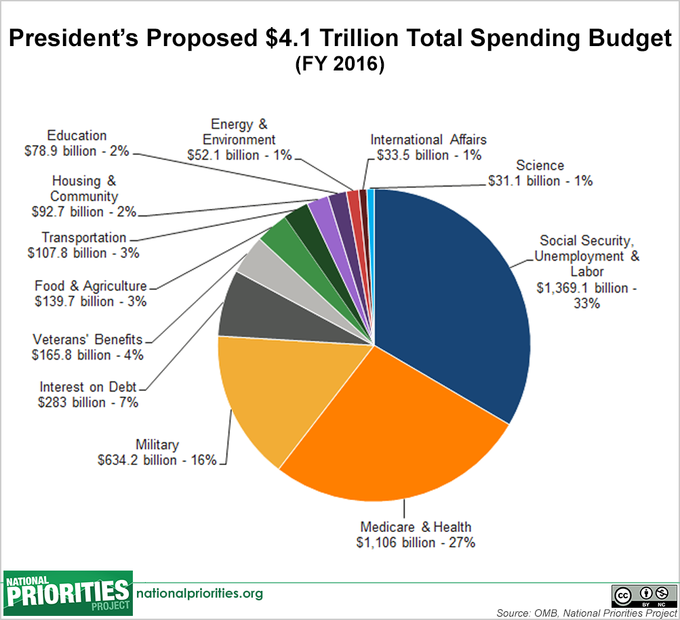 Notice anything missing and/or confusing in the President’s 2016 Budget in Pictures pie charts? Allow me to point out a few incongruities. Above, you see the pie chart of categories for the 2016 Total Spending Budget. There are several more pie charts at the website including pie charts for Mandatory and Discretionary categories. According to a budgetary pie chart I was perusing a few days ago the "the military budget" is analogous to the Military Defense category of the Defense budget - NOT analogous to the Defense budget with which it is sometimes, and wrongly, used interchangeably. It was also stated that the funds for the State Department and all Intelligence Agencies are also allocated within the Defense Budget. But funding for both the State Department and Intelligence Agencies are noticeably absent in all of the pie charts. Many seem to believe the Defense budget is ONLY dedicated to military costs . . . and yes, it was unclear to me also, which is why I decided to seek some clarity about what seems to be mislabeling. Is State Department and the collective Intelligence Agency funding really provided for in the Defense budget? If so, I suggest in the interest of accuracy, transparency, and accountability, that they need their own funding category rather than apparently being "hidden" in the Defense budget. There are other dilemmas associated with the pie charts. It seems there is no category for either State Department or Intelligence Agency funding - at least they are not categorized as such, nor under what could appropriately be a Diplomacy budget category. Additionally, it seems that the category designated as "military" in the pie chart may actually be the Defense category, given there is no Defense category. Is it any wonder there is confusion about the labels of the categories and what they encompass? According to a more detailed itemization of categories within categories within categories, it seems apparent from another website: Government Spending Details, which is about the proposed 2017 budget, that both State Department and Intelligence funds are part of the Defense budget, albeit not clearly listed as such, but present in that budget for all practical purposes. Looking at how the Defense budget is roughly itemized, Military Defense is a large category of the Defense budget, but only part of the Defense budget. It has been educational to peruse the categories which I found listed in the above mentioned website. Since the subject of my own concern, here, is the Defense budget, I have put an asterisk by items in the list, below, which are apparently NOT military related. Many fit into what seems to be the absent State Department category. Perhaps there are additional State Department categories not listed as such in the Mandatory budget as well? Some categories seem to be unitemized, unclear, and unfunded "place holders". Presumably, they could be used for anything which likely means they fund Intelligence activities thus might or might not also be included in the Mandatory budget in some subcategory or another. Personally, I would consider taking State Department funding and Intelligence (including FBI) funding out of the Defense budget and putting it in a category of it's own, say . . . a Diplomacy/Diplomatic budget, or at least making it an individual category of the Defense budget. Would a Diplomacy budget category be appropriate in the Defense budget? Why not? The State Department is home to the Diplomatic Corps so when it and Intelligence Agencies (including FBI) are employed for the appropriate reasons, they are being used diplomatically. And, in reality, Diplomacy actually IS the best defense. So I could see a Diplomacy budget appropriately fitting into the Defense budget if it were to be more clearly designated as such AND if it were to be more clearly emphasized that the Defense budget is not analogous to "the military budget" but includes many more major categories of defense which are not militarily oriented. Because of incongruities associated with labeling of “the military budget” I wanted to better understand the budget categories. It didn’t take much perusing to understand there is confusion between the designation of “the military budget” and the Defense budget designation. And after looking at further categorizing of the Defense budget I was somewhat astounded at what it includes in addition to the Military Defense category (the designation which actually IS "the military budget"). After making an effort to clarify the Defense budget categories for my own interest I have to question why the “murkiness”. It leads to questioning whether or not there is an unacceptable purposeful effort to create unnecessary confusion. Plus, it may indicate the same type of misleading murkiness exists throughout the entire budget - in some way of another. It is somewhat unclear which Government Department is the abode of our Intelligence Agencies. Department of Homeland Security? DHS is not listed in the Defense budget which, based on the name, seem to be the place it fits. But in reality it is a catch-all "home" to a number of Departments. DHS is described as "the integration of all or part of 22 different federal departments and agencies into a unified, integrated Department." But, clearly, the budgeting of it's funds certainly is not "unified and integrated". Why not be straight forward with budgetary categories? Diplomacy could easily be considered Defense. But when there is not a designation of Diplomacy to put State Department and the Intelligence Agencies into, it seems there is intent to “hide” these categories. It is no secret the State Department exists. It is no secret the Intelligence Agencies exists. But it seems to be a “secret” that they are funded and under what categories unless, of course, they are part of the catch-all Department of Homeland Security for which I have found no visible category of funding. We really do need more transparency and more accountability when it comes to federal budget categories. Again . . . what's with the unacceptable and seemingly purposeful effort to create unnecessary organizational confusion? The response of our Legislative Branch in the past year or so to debating and approving a budget is certainly evidence of the prevalence of our Legislative body's collective budgetary confusion . . . which should not be as pronounced as it has been. I advocate budgetary categories being analogous to organizational framework categories. Clearly, if budgetary categories were analogous to the departments of which they are part, budgeting would be less problematic. The President's Budget for Fiscal Year 2017 at the White House Website. FYI the Defense budget categories, below, are from the 2017 Government Spending Details. The website actually provides all categories of the budget and funds allocated. Anyone interested in discussing the budget with elected and appointed government officials might find it worth perusing. There are likely a number of websites presenting the same information in a variety of forms.